Hollywood based Filipino fashion designer Oliver Tolentino now adds an American Idol contestant to his celebrity list. 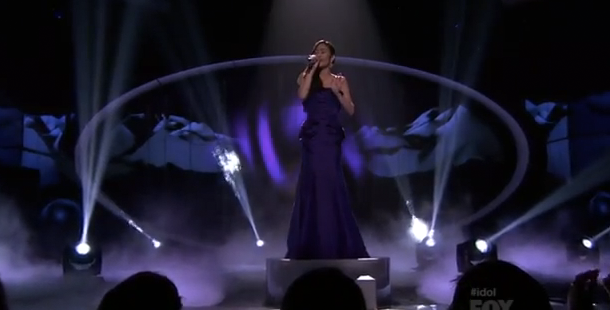 Jessica Sanchez, one of the three remaining contestants, wore Tolentino’s purple dupioni silk creation to compete on this week’s show. The mermaid-cut structured gown featured a bustier draped bodice with ruffles & pleats accenting the hip. 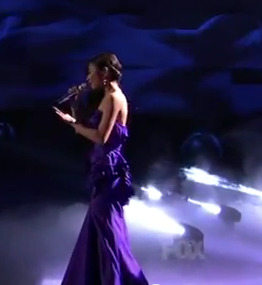 Sanchez wore the gown when the contestants first appeared and then sang Mariah Carey’s “My All,” one of her three songs for the night.